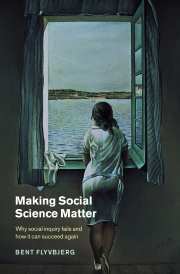 In Making Social Science Matter, Bent Flyvbjerg examines the possibility that “the study of social phenomena is not, never has been, and probably never can be, scientific in the conventional meaning of the word science; that is, in its epistemic meaning,” and he explains why other fields tend toward such strong natural-scientific theoretical ambition. There is a logical simplicity to the natural science paradigm and the natural sciences have impressive material results. Chapter Three, Is Theory Possible in Social Science, includes a brief exploration of the argument that natural science is “historically conditioned and requires hermeneutic interpretation” (p. 28). Flyvbjerg characterizes social science as “pre-paradigmatic” in the Kuhnian sense, which means that it “is in a state of constant reorganization, characterized by a multiplicity of directions” (p. 30). He then dispenses with the pre-paradigmatic argument that, with enough time, the social sciences can achieve the status of paradigmatic science. Flyvbjerg argues that social science is no closer to achieving cumulative progress and that some natural sciences that are younger than social science already display such progress. He cites the hermeneutic/phenomenological argument. In social science, individuals and groups dialogue with researchers who themselves acknowledge the situatedness of their research activity. They are not separated from their subjects.